When shopping for Deck Paint the first thing you should know is that there are a few different types of finishes you can put on your deck. The most common is a sealer and usually the least effective. The next are stains, they are thin colored liquids that add color to you wood and leave little or no surface film. They soak into the wood mostly and fade very quickly from UV rays and foot traffic. 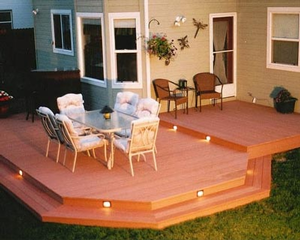 Next are deck paints that come in two versions, translucent and solid color. The translucent versions let a little bit of the wood grain show through, the solid color types will conceal the wood grain completely. Depending on the quality of the paint they will last better that sealers or stains. The best deck paints such as our Armor Super Deck Paint will last from 3-5 years while sealers and stains and most other paints will last a year, causing you to strip and repaint every year. There’s another option that is a Deck Coating. Our ArmorGarage Renew It coating is a cementitious product that starts out as a solid that we emulsify into a liquid and when applied to your deck it cures back into a super thick textured solid. This is a far superior product for coating your deck. We use only industrial grade materials and cut no corners! This is a coating that actually lasts! You will not find a product equal to Renew It anywhere else. We manufacture and sell direct to you. Engineered ultra high performance products that penetrates into your wood deck or porch to give it superior adhesion capability while still allowing the wood to breathe. ArmorDeck is made with Molecular Adaptive Technology, which allows it to have superior wood adhesion, durability, and flexibility. Available in 24 designer colors it will turn any old worn out deck into a beautiful new deck that’s better looking than it was when first installed. Being textured it’s naturally slip resistant while being bare foot and pet friendly. It’s nontoxic and easy to apply with our special rollers.